Champlain College has moved its Emergent Media Lab to Winooski. It's been up and running since September in the Champlain Mill. Champlain student and What's Good blogger James Kleimann took a tour on Thursday with Emergent Media Center director Ann DeMarle. I just published his blog post. Check it out on What's Good. 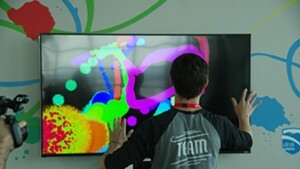 If you think the biggest social message in video games is to sit around on the couch, eating Doritos and “pwning n00bz,” you need to check out Champlain College’s Emergent Media Lab at the Champlain Mill in Winooski. The staff and students there will eject those notions. There may be no restart button in real life but the Champlain Emergent Media Center is resetting the idea of what video games can be.